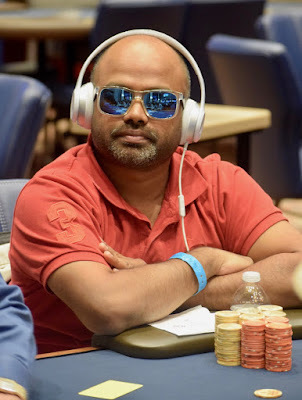 Three players all-in preflop - Ace_Queen for @TVPokerRoom National Ambassador @TylerPoker Patterson, Pocket_Nines for Reddy Thonduru and Pocket_tens for Raghuram Jonnalagedda who has his two challengers covered. Thonduru hits a set on the J-9-x flop. The board, however, runs out J-J and Jonnalagedda goes Boat over Boat to eliminate both Patterson and Thonduru on the same hand.